TBS are known for their high-specification products and you are getting a very polished drone for your money. FPV racing is a quick growing sport and today many pilots build their own drones. However, this practice is about to change. Team Black Sheep announced the Vendetta Pro Racer on February 9th. The Vendetta is one amazing piece of racing UAV engineering. 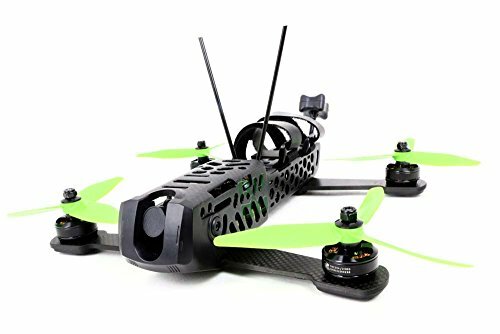 Many pilots claim that this is one of the best RTF FPV racing drones on the market today and that it comes with features they have never seen on a UAV of this size. This RTF product has an amazing feature list. It combines the best specification components within attractively designed and truly unique body. The Vendetta Pro Racer comes in a ready-to-fly (RTF) bundle, meaning a backpack, battery, battery charger, 4 spare props, 2 spare arms, tool set and FPV remote control are all included in the box. You can experience the thrill of flying this quad in as little as 5 minutes from box opening. You will see that flying the TBS Vendetta is pretty simple for a drone of such advanced design. You can personalize your FPV Vendetta according to your own needs. Also, you can even upgrade it with a stronger power system. There’s been a lot of thought gone into the design of this racer. In order to achieve its unibody design, all structural parts on the Vendetta are made of carbon and fiber. After the mold is done curing, it is then machined to precise standard on a 4-axis CNC machine. After that, this machine cuts all of the remaining holes. It also smoothes out any rough edges. The matte finish is sand blasted to give the frame its smooth and natural look. The uniquely molded carbon-fiber design is the first thing you will notice about this quad. The swappable arms, which are made from flat 3.5 mm thick carbon fiber plates, are one of the more interesting things about this frame. They are also chamfered to avoid delamination over time. The arms have integrated motor wires running through them that plug into the frame. The TBS Vendetta has a really amazing design. However, the firmware and electronics used will determine what the flight characteristics are. Fortunately, all of the firmware and electronics in this drone are top quality and they will allow you to compete with custom drone builds. Most of the electronics on the Vendetta are all in one place and connected without any wires or soldering. This means that if something breaks, you won’t have to solder anything to repair it. TBS recommends that you could carry around different parts, to be prepared for any eventuality. This FPV drone is equipped with Cobra 2204 2300kv motors that make it extremely fast. These motors have crazy amounts of power and they are some of the best known motors in the drone industry. This racer quad is also equipped with LED lights. They can change colour depending on which direction you are turning and how much throttle you use. The flight controller comes pre-programmed for all modern flight controls. TBS went with a custom controller, running the popular 72 MHz STM32 F3 microprocessor. There are also some super fast gyros to go with it. Because the design for the controller is custom, the power to the controller is provided through the brass standoffs used to mount it to the ESC’s. A good firmware is probably the most important thing that a good racing drone should have. TBS used the firmware called CleanFlight. They modified it so that it could be set up and tuned from their OSD. This means that you won’t have to set general settings on your PC. These features provide plenty of capability even for moderately sized filming equipment. It is also a perfect match for FPV racers. The installation of a receiver may seem like a difficult job for people with no experience. However, in practice this is pretty straightforward and only involves plugging the provided cable into the receiver. TBS Vendetta Review. $500 Racing Drone. Flying from the screen is not necessary. However, thanks to special anti-reflective and anti-glare coating it is possible. The video receiver delivers unparalleled range as it is precisely tuned to its environment. You can connect any goggles to your controller using the proprietary „TBS port“. This allows for crystal-clear video as well as long-lasting power. And the best thing is that you don’t need externally batteries. Finally, the built-in receiver antenna covers 180 degrees in forward facing direction. Space inside the quad is tight so you should check your receiver size before ordering. The technical specs on the ESC’s couldn’t be any better. All four of the ESC’s are powered from the brass standoffs. Also, each ESC has a special plug that brings signal information up to the next floor, eventually reaching the controller. All four of the ESC’s are 6S capable, running BLHeli with Oneshot. Also, you can run them anywhere from 30A to 50A, depending on the weather conditions. Essentially they both fly almost identical. They both look really good. TBS has got to be congratulated for experimenting with a new type of building process for carbon fiber. This is really cool whether it actually does anything to the flight performance. Vortex Pro is an absolute tank. I’ve seen this thing being totally smashed up – it is really fantastic for a new pilot. You really want something that’s not going to break and going to keep on going. Sure it’s a little bit heavier but it really is built like a tank. You’ve got something there that you can go and do some silly things and get away with it. You probably already have some FPV racing drone experience if you are considering spending your money on the TBS Vendetta. Team Black Sheep are known for their high-specification products and you are getting a very polished quadcopter for your money. It is very nice to see RTF racer sporting parts which are usually reserved for high-specification custom builds. For those people who want a simple to configure and modify system or don’t want to put together a custom racing quad this machine is amazing product. The agility and speed of the this TBS drone makes it an incredible racer. On the other hand, advanced flyers may find this quad somewhat restrictive and for the price you could build one amazing custom racing quad. However, not everyone has knowledge, inclination or time to do this.